This beachfront retreat overlooks the gorgeous emerald waters of the Gulf of Mexico. Guests can enjoy a variety of water sports, shopping and vibrant nightlife just steps away from the hotel. The hotel offers two gulf-front swimming pools, indoor and poolside dining options and a 24-hour fitness center. Accommodations include comfortable guestrooms and suites, some with private balconies. 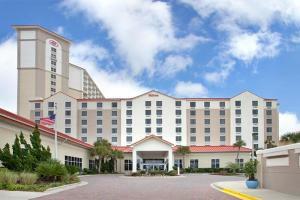 Located about 10 miles from Pensacola International Airport.